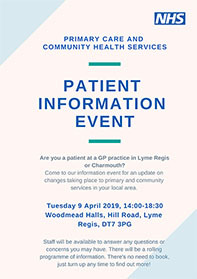 We are delighted that Dr Simone Yule, the North Dorset lead GP, will be joining us at our May events. She’ll be telling us about how Dorset GPs are working more closely together to deliver better patient care in today’s NHS. You can also hear from LiveWell Dorset who are helping local people lead healthier lives and some PPG groups who will be telling us about their work with their practices. PPG members, practice managers and all interested members of the public are welcome to come along to these events. It would be great to see you there. Jim & Gill your PPG support team are tweeting! You can now contact Jim and Gill and get messages about your PPG activities and other key messages out there using Twitter. Jim and Gill are new to it all but keen to get more of you following them. If you’d like some guidance on setting up a Twitter feed for your PPG contact james.gammans@dorsetccg.nhs.uk or gill.foott@dorsetccg.nhs.uk. Follow them on @GillFoott or @JimGammansCCG. This project offers to come to your PPG meetings – Stepping into Nature is led by Dorset Area of Outstanding Beauty and aims to improve health and wellbeing for those 55+ including those living with dementia and their care partners by creating opportunities to connect with nature through a wide range of activities delivered from Lyme Regis to Swanage (see link for more information and contact julie.hammon@dorsetcc.gov.uk to discuss a visit to your PPG meeting). Offers to come to your PPG meetings. Want to find out how Livewell could help you, your PPG members and the patients at your surgery lead healthier lives? Speak to them at our events on 8 & 9 May or contact them via their Livewell Dorset website. They would be happy to support any local events you might be organising. Have you had experience of using our MSK services? We’re looking for patients to tell us about their experience to help us shape a dedicated MSK website. We’ll be holding a focus group towards the end of April, depending on the availability of participants, where we’ll discuss what information patients would find most useful to have available online. We may also survey service users. If you’d like to be involved in any way, please contact michelle.hindmarch@dorsetccg.nhs.uk for more information. Closing date 21 April. NIHR is looking for patients, carers and members of the public with lived experience of health, services and social care to join national and regional committees. Applicants should have a broad interest in health and social care issues beyond their own lived experience. For more information and to apply visit the NIHR website. 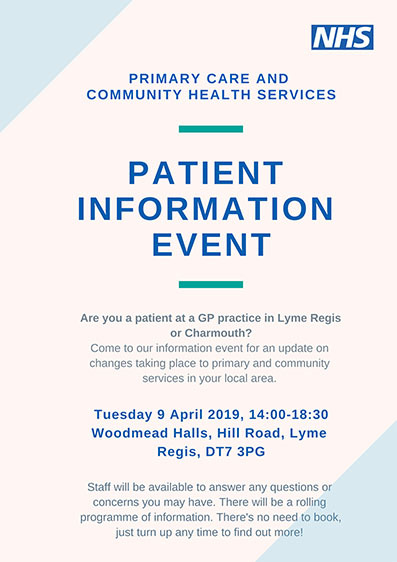 Are you a patient at a Lyme Regis or Charmouth GP practice? Join us at the Woodmeads Hall to find out more about the future of local primary and community services in the area. Our event on 13 March at the Allendale Centre went down a storm! We had over 110 guests representing patient groups, local authority, community and minority groups and the voluntary sector. Our guest speakers, Dr Karen Kirkham (Assistant Clinical Chair for the CCG) and Jill Haynes (DCC Deputy Council Leader) gave some great examples how Health and Social Care services are working closely together. Take a look at the Our Dorset website to find out more. You can watch our short Supporting Stronger Voices event video here. Dorset’s Local Maternity System (LMS) is proud to launch the Maternity Matters Dorset website – a brand new online guide to pregnancy, birth and beyond to support those who are expecting. Do have a look at the site and encourage family and friends to use it! It’s had some great feedback! 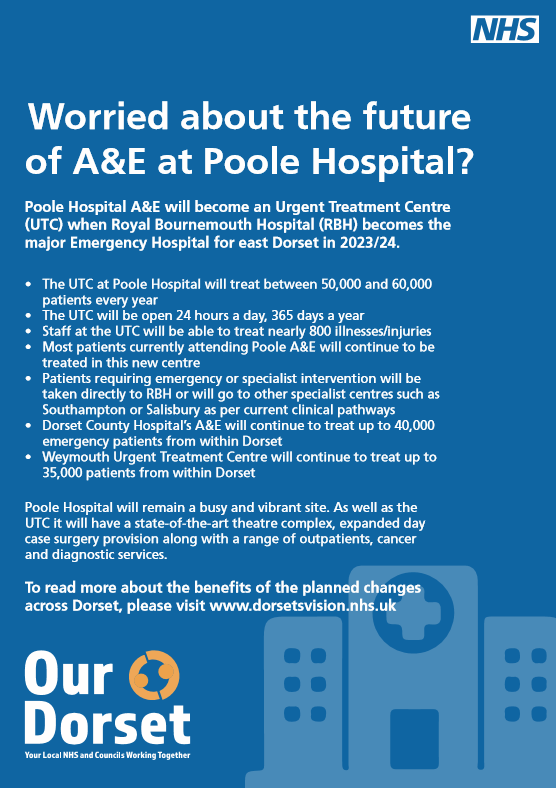 We’re telling the public about the positive future planned for Poole Hospital. When you become ill or need medical help, using the most appropriate service can save you time and help manage demand on local services. 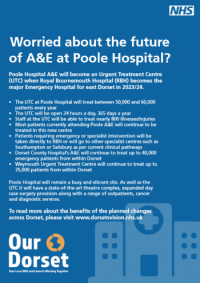 For example, did you know that in Dorset there are minor injuries units and an Urgent Treatment Centre that can treat urgent conditions that aren’t life threatening, or that you may be able to get a GP appointment out of hours by calling 111? Find out what options are available to you by visiting NHS Stay Well. Bowel Cancer Awareness Month is an annual opportunity to raise awareness of bowel cancer and its symptoms. Young, old, female or male – it affects us all. 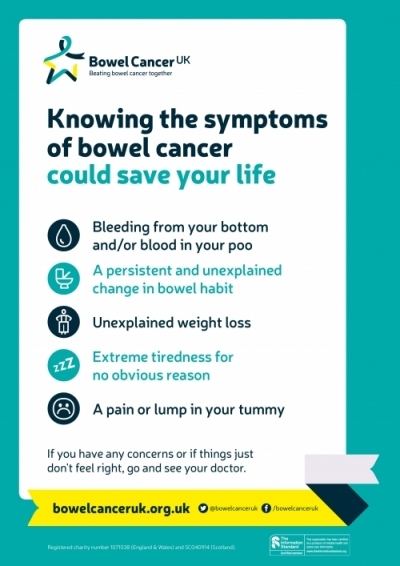 Every 15 minutes in the UK someone is diagnosed with bowel cancer, but it is treatable and curable especially if diagnosed early. Make sure you know the symptoms and go to your GP if something doesn’t feel right.